Universal Group of Intuitions observed World Aids Day at its campus . A Seminar also held at this occasion for the students. The causes, symptoms, and nature of the AIDS causing HIV virus, its transmission and precautions were discussed. The students and teachers delivered informative lecture on various aspects pertaining to the HIV AIDS and the myths and misconceptions surrounding this deadly disease. 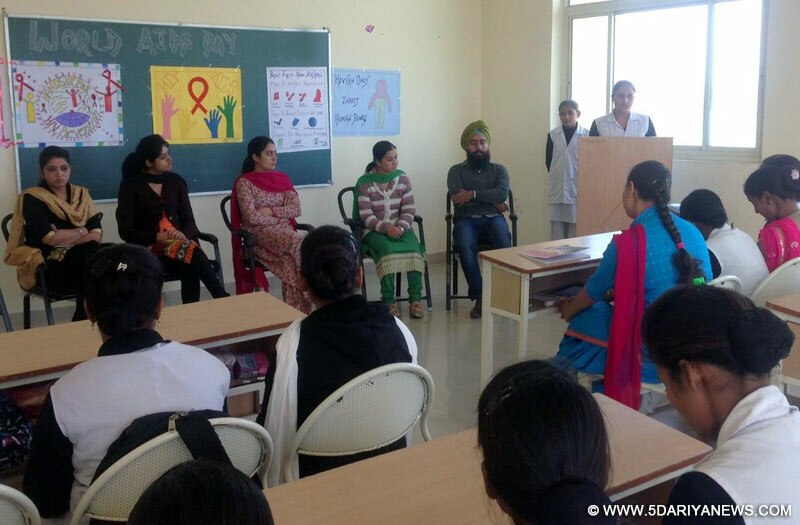 Addressing a seminar Chairman Dr. Gurpreet Sing said that with more than 3 million people dying from HIV/AIDS in the world annually, it is awful that reasonable efforts are not being made worldwide to stop this epidemic. India is under severe attack while Punjab is under brutal assault. AIDS is not simply a health problem but with it come social repercussions which cause the victim to be stigmatized in the society, which is unfair, he added.He motivated students to work hard and avoid drugs and adultery. Students and teachers pledged with candlelight that they would spread awareness among vulnerable groups, which included truck drivers, migratory laborers and rickshaw-pullers.